Last Friday evening, whilst riveted to the Kate Bush night on BBC4, I experienced, within a huge and powerful wave of nostalgia, a flashback to the short era of a guitar synthesizer which I’d assimilated with great interest in 1986, but subsequently forgotten all about. Above: Some distilled scenes from the Wogan show performance of Experiment IV, circa autumn 1986. As I post, the whole mesmerising compilation is available to watch on the BBC iPlayer in Kate Bush at the BBC, but these programmes are usually only available online for a limited period, so apologies to anyone who can't access it at a later date. The Stepp DG1 was an enormous project, four years in the making and funded with £1,500,000 (one and a half millon) in venture capital through the early to mid 1980s. I’m tempted to say that it was premiered in Chicago at the 1986 NAMM show, but since the manufacturers were so cagey about all that development and investment being trivialised by some hack reviewer, they heavily restricted access to the DG1. The DG1 was there, but by all accounts random outsiders were barely allowed to look at it, let alone touch it. It seems serious viewing was by appointment only. The wonder-device was officially released on the UK market in September 1986, although the wheels of distribution were quite slow, and certainly worldwide it took some considerable time for the stock to reach its destinations. The suggested price was a hefty £3,500 ($7000 in the USA) [UPDATE: UK price was VAT-exclusive, so would be over £4,000 at the point of sale]. Seems like ‘Steep’ might perhaps have been a better brand name, but in fact this price point massively undercut the existing talking point in guitar synthesis – the SynthAxe system. Finding examples of dealers advertising the Stepp DG1 in old printed matter (and therefore establishing a ‘street price’) is, however, next to impossible. It obviously wasn’t a mass market instrument, and very few dealers stocked it, even in its home country of England. The Stepp DG1 was the first fully integrated guitar synthesizer. It was significantly pre-dated by the in some ways similar SynthAxe, but unlike the SynthAxe, the Stepp didn’t just interface with a synthesizer, it incorporated, and effectively was one. 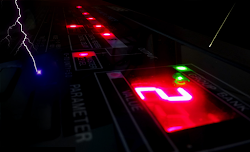 What’s more, whilst the DG1’s control features were digital, its synth engine was driven by analogue oscillators – dual oscillators, with the kind of architecture you’d find on something like an early ‘80s Roland keyboard synth: standard ADSR analogue envelope parameters, and even a Roland-type Alpha Dial for control of the 100 memorised patches. But there was no concern about polyphony with the DG1, since each string had its own dual oscillator allocation. Anything you could play on a guitar, you could play on a Stepp DG1. That obviously wouldn’t be the case with a SynthAxe if you connected it to an outboard device with limited polyphony. And since the DG1’s per-string oscillators were independent, the instrument could perform multitimbrally too. Different timbres for different strings. Nope. No latency on the Stepp DG1 – unlike the typical add-on guitar-to-synth MIDI converter of the day. 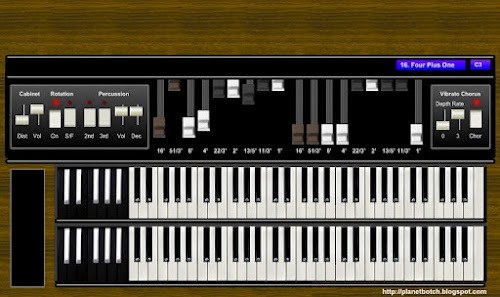 The DG1 didn’t use a converter to translate control information into sound – it used the same principles as a keyboard synth: direct electrical connection between the played note and the tone engine. Something like this was always going to take some getting used to after playing standard guitars. 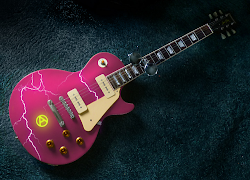 The neck in particular, whilst designed to allow the player more scope than an ordinary guitar neck, was different and would therefore in the first instance feel alien. The Stepp had a regular electric guitar weight (albeit at the heavier end of the scale), but again, the body shape was alien, and perhaps a bit ‘space age’ – even for an experimental guitarist in 1986. Sadly, the Stepp DG1 was very short-lived, and was out of production by 1988 – less than two years after introduction. Upon launch the Stepp was a remarkable device, and it genuinely did bring guitarists the most sympathetic implementation of guitar synthesis then available. But the mid to late ’80s was a notoriously bad time to be making big investments in technological devices, since as soon the products were released, it was so often the case that feasibilities had advanced across the board, and more could be done for a much lower price. Around the time of the DG1’s introduction, advancements in MIDI guitar technology were changing the market, reducing latency and making the fully digital route a lot more viable. 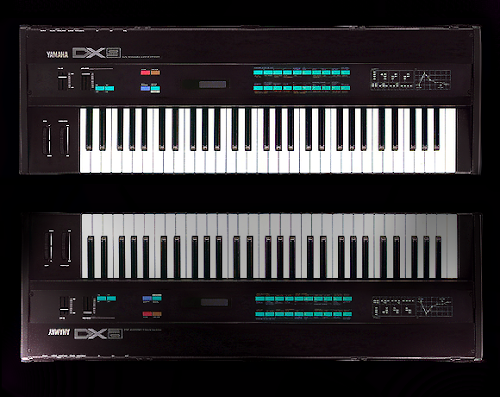 Roland produced the industry standard in late ‘80s MIDI guitar equipment, but Stepp’s dream was probably demolished equally if not more by the likes of Casio and their mega-cheap synth guitars of 1987. Obviously, the Casio gear would not do what the Stepp DG1 could do, but it did seriously drive price point expectations way south of the Stepp’s ballpark and leave the DG1 basically isolated in more-money-than-sense territory. The desperation apparent in secondhand column ads for Stepps in the late ‘80s highlights the horror of their rapid devaluation. Sellers would be scything enormous chunks off their pitch prices from one publication to the next. The phrase ‘white elephant’ definitely comes to mind. There was also that question mark over whether guitarists wanted a guitar synth to look so far removed from a conventional guitar, or to have such an alien feel. 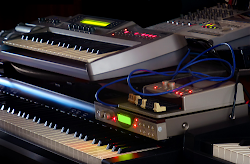 Most of the evidence by 1987 was pointing to the fact that guitarists wanted conventional looking electric guitars, and Roland’s success with MIDI translators (as opposed to actual MIDI guitars) suggested that many users just wanted to retain their original instrument and retrofit it for use as a synth. Finally, would so many late ‘80s musos even take up the guitar in the first place if they really wanted to produce synth sounds? In the early ‘80s when synths were still prohibitively expensive for most musical beginners – yes, kids may be swayed towards learning the guitar first, and then, once established, consider exploring synthesis. But by 1986 that was no longer the case. Popular synths were now almost as cheap as guitars, so beginners with a hankering for synth sounds would just start on synths. That would diminish the role for the guitar synth. Stepp introduced their own MIDI guitar (the DGX) very soon after the DG1, at a much more affordable price of £1,575 [UPDATE: Again, this excluded VAT, so over £1,800 at the point of sale]. However, even that was too big an outlay given the condition of the market by 1987. Early 1990s overviews of guitar synthesis pretty much set both the Stepp and SynthAxe systems into the footnotes… Too expensive; too complicated. There probably was a bit more to their failure than that, but that short sentence is one which must have been reverberating around the inventors’ heads day after day after day.